The silo has a height of 48 feet, 2 inches; and an average inside diameter of 16 feet. However, it is not perfectly round nor perfectly vertical. The diameter varies by about 3 inches as you go up and it leans a tiny bit to the north. The positions of the Date Lines and Time Lines were calculated using a Radio Shack Model 3 personal computer at the Louisa Country Club. These calculations are specific to the latitue and longitude of Louisa (38N, 78W). At any other location on earth, the lines would be quite different. The artwork of the "past" is adapted from what is claimed to be a 16th century German woodcut, first published in "Weltall und Menschheit," edited by Hans Kramer. However, the picture was also used (copied?) 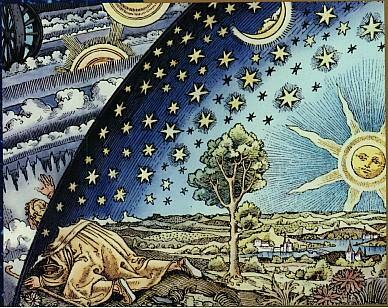 by the French Astronomer Flammarion in the 19th century. The artwork of the "future" is adapted from a gold plaque sent into outer space beyond the solar system by the NASA Pioneer 10 and 11 spacecraft. These were the first spacecraft ever to have a trajectory which would go beyond the orbit of Pluto. 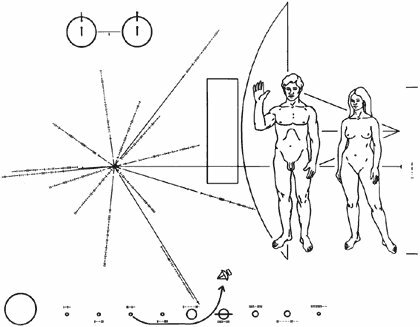 The original plaque was designed by Linda and Carl Sagan. All the art was selected, adapted, composed, and painted by Moira Kavanagh (now Moira Crosby). Most of the "second story" work was done by Damian Kavanagh. The project was conceived and coordinated by Dr. Larry Kavanagh. The original project was opened in 1985 at the Autumnal Equinox. Renovations (restorations!) were made in the summer of 2004 by Larry and Judy Kavanagh. These four co-fabricators have left their initials on themural in a unique manner. Can you find their mark? Yes, it was scary at the top of the scaffolding.